Skin feeling a little parched now the mercury has dropped and the aircon has started cranking the heat? 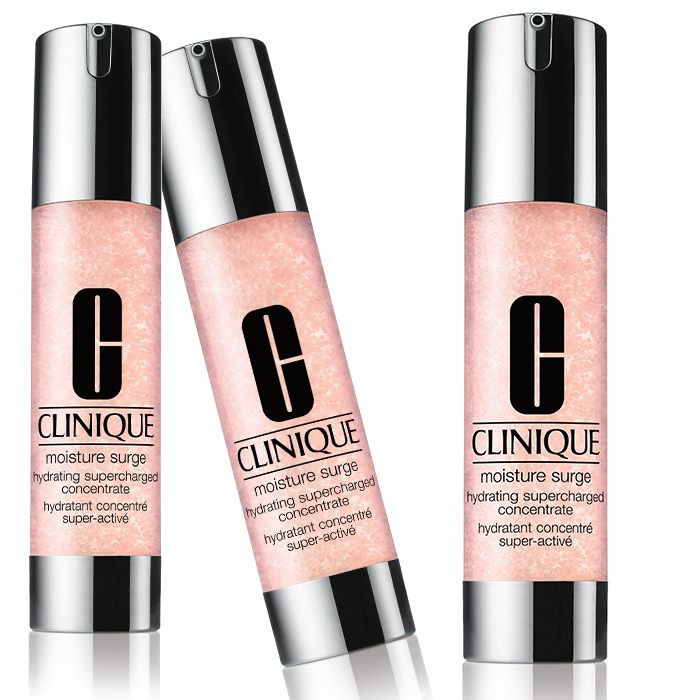 Lucky for you then that Clinique have kindly added to it Moisture Surge collection of super-hydrating products with a new water-gel hydrator that feels like heaven on the skin. 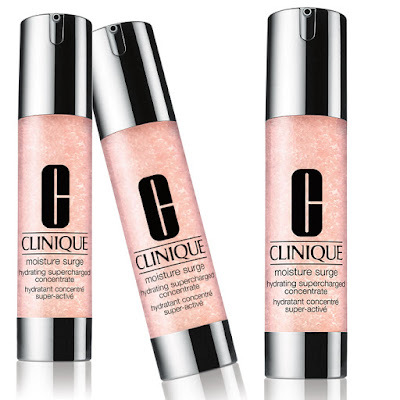 The latest addition to the moisture quenching range is the Clinique Moisture Surge Hydrating Supercharged Concentrate, and it’s an intensely hydrating formula that boosts skin’s moisture levels for a full 24-hours, and how. The pretty pink bottle delivers a surge of hydration to help increase skin’s moisture reservoir with an immediate 179 per cent moisture boost for starters, and that is retained for 24 hours at 65 per cent. Amazing. The ultra light water-gel includes water-binding agents that are in there to lock in hydration and strengthen the skin’s moisture barrier to better resist environmental aggressors, delaying the signs of aging. It works to prevent dryness with its clever “Liquid-Sphere Technology”, which combines water-binding ingredients with encapsulated antioxidants, vitamin C and vitamin E, and absorbs instantly so anything added on top will glide on as normal. I particularly love that the water-based formula has an almost instant cooling effect on the skin that is pretty damn delicious and will mean that it’s still a great option come summer. Like all Clinique products, the Moisture Surge Hydrating Supercharged Concentrate is allergy tested, and 100 per cent fragrance free. It comes in a see-through airless container, and apparently the pink-y shade of the gel is due to the presence of skin-enlivening, peachy-pink pigments designed to make the complexion look fresher and more radiant. Clever. You apply Clinique Moisture Surge Hydrating Supercharged Concentrate as part if the brand’s 3-Step Skin Care System to lock in hydration, and I have found that a single pump will cover your entire face. If I’m feeling particularly dry I add a moisturiser over the top, and foundation glides on like a charm. The end result? Super soft, hydrated, and plumped up skin – instant gratification if ever I saw it! Clinique Moisture Surge Hydrating Supercharged Concentrate is available right now at Clinique counters nationwide and at www.smithandcaugheys.co.nz and www.farmers.co.nz for a suggested retail price of $99.